Celeste Ayala's picture has gone viral on the Internet. 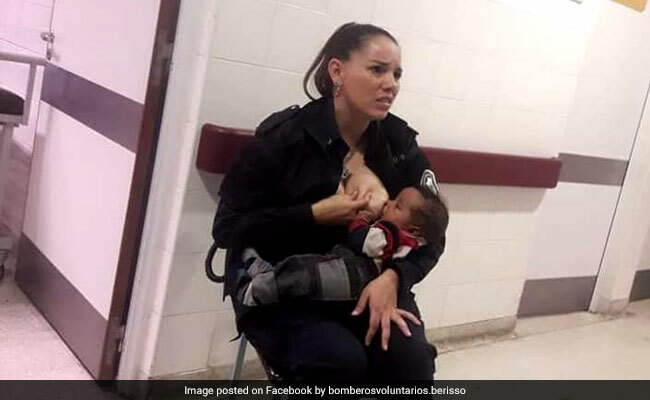 A police officer in Argentina is being hailed a hero for stepping up to care for a malnourished baby by breastfeeding him. Officer Celeste Jaqueline Ayala was working guard duty at a children's hospital when the neglected infant was brought in. On hearing him cry in hunger, she asked hospital staff if she could hold the baby and began to nurse him, reports the Mirror. The crying baby began to calm down as soon as he was fed. The incident took place last Wednesday at the Sor Maria Ludovica children's hospital in Buenos Aires. A picture of the touching scene was clicked by onlooker Marcos Heredia and shared on Facebook, where it quickly went viral. Since being posted online, the picture has collected over 1 lakh 'shares' and hundreds of comments praising Ms Ayala on Facebook alone. On Twitter, her name has even been turned into a hashtag. Celeste Ayala, you are a beautiful woman with a beautiful soul. Bless you for caring about that poor helpless child. In fact, the act of kindness on Ms Ayala's part even reached the vice president of the legislature of Buenos Aires, Cristian Ritondo, who promoted her from police officer to sergeant for her "gesture of spontaneous love." "Today we received Celeste... to notify her of her promotion. We wanted to thank you in person for the gesture of spontaneous love that managed to calm the baby's cry," he wrote in a tweet on August 17. The Bomberos Voluntarios Berisso fire brigade, where Ms Ayala volunteers, also wrote a post to congratulate and praise her. "Actions like that of this cadet fill us with pride and force us to redouble our efforts, and work in solidarity with our community," they wrote. Celeste Ayala says she did not think twice about helping the baby. "It was a sad moment, it broke my soul seeing him like this, society should be sensitive to the issues affecting children, it cannot keep happening," she said to Cronica, according to the New York Post. In a similar incident in June this year, a policewoman in Bengaluru won people's hearts when she breastfed an abandoned newborn.